Social Media is the new battleground for online marketers everywhere. Ever since Google introduced social signals as a ranking factor way back in 2010, people have been scrambling to establish themselves prominently on the social networking scene. A few years back, no one has even heard the term "social signal" before. What's behind this drastic invention that would ultimately reshape the whole search industry? Well, it might have started when Google started rolling out updates for its ranking algorithm a few years ago. The old PageRank system was an effective algorithm, but people still managed to get around it. In some instances, low quality websites that used black hat SEO techniques to grapple their way to the top places on SERPs (Search Engine Ranking Pages) would outrank legitimate websites. Internet users would have none of this. Along with two major algorithm updates in the past couple of years (namely Google Panda and Penguin), the introduction of social media signals meant that people can now "vote" for webpages that they deem to be relevant to their search queries. The introduction of social signals spelled a new era for search engines. Every like, share, tweet, and pin is now crucial to the online marketer. Aside from the usual optimization techniques (like the use of keywords and links), content is also being optimized for share ability and social media readiness. Google Plus + - The King of "Social Search"
The whole search process has also become more "social". This fact became more obvious when Google introduced the Google Plus + social network in June 2011. The social signals from Facebook and Twitter, being two of the largest social media networks on the Internet today, are already weighted heavily by search engines. However, the Google+ social network would take the connection between social media and SEO one step further. For one, Google has integrated its search service with the Google+ network. They are the pioneers when it comes to "social search." When a Google+ users logs onto the network, he or she can receive personalized search results as well as receive suggestions about people and pages that are related to a particular topic area or subject. Another thing that online marketers can take advantage of is the Google+ authorship profile. This feature helps people establish authorship over their content. It also comes with the added bonus of having their name; information and profile picture show up next to the content they've authored on search results. Since numerous experiments have shown that people are more likely to click on something if it has the author's name and picture on it, this can help marketers gain necessary exposure on search results. 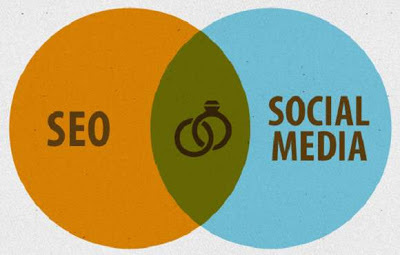 From what we can see, SEO is becoming more and more dependent on social media. It's safe to assume that this might very well be the future of everything that has anything to do with search optimization.